4x fail - if you look at the latest cold-water immersion science. There are proven acute regenerative benefits of both cold water immersion and cold/ice application after exercise... cool? Not so cool, no. Two recent studies demonstrate: In the long run both will impair your gains. The studies from Japan (Yamane. 2015) and Norway + Australia (Roberts. 2015) were conducted independently and published almost simultaneously in the International Journal of Sports Medicine and the Journal of Physiology, respectively. Therefore, I'd like to discuss them one after the other, before I finally tie the knots between the studies in a conclusion some of you are not going to like. At the end of the 6-week training period, the wrist-flexor thickness, brachial artery diameter, maximal muscle strength, and local muscle endurance were measured in upper extremities. Figure 1: Rel. changes (%) of forearm diameter (muscle size), muscle strength (of the wrist flexors), brachial artery diameter (vascular adaptation) and local muscle endurance (Yamane. 2015). The results in Figure 1 may come as a nasty surprise to some of you: The wrist-flexor thicknesses of the experimental arms increased after training in both groups, but the extent of each increase was significantly less in the cooled group compared with the non-cooled group. That this is not a question of post-exercising swelling, only, can be inferred from the fact that the maximal muscle strength and brachial artery diameter did not increase in the cooled group, either. That's much in contrast to the non-cooled group where both variables, as well as the local muscle endurance, increased significantly. If we assume that similar effects occur for other muscle parts, it would thus not be a good idea to join Peer Mertesacker in the ice-tub that made him world-famous after the quarter-finals of the soccer world cup, last year. 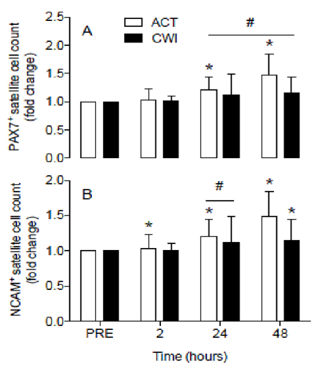 The satellite cell activity of which SV readers know that it is driven - at least partly - by the inflammatory response to exercise is blunted in the cold water immersion (CWI) vs. active recovery (ACT) trial (Roberts. 2015). 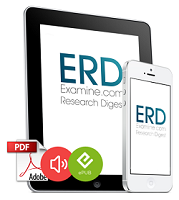 What's the reason the treatments have different acute vs. long-term effects? As usual, the answer to this question is hormesis. Luckily, Roberts et al. did what it takes to provide insights into the possible mechanism in the second study in which they investigated the acute effects of active recovery and cooling on a handful of parameters that are highly relevant for the chronic adaptations to resistance training (see study 2, below). Among those were the satellite cell activity and the phosphorylation of the protein synthesis motor p70S6-kinase, both of which were significantly more pronounced in the active recovery vs. cold immersion trial. The IL-6 and VEGF response which was measured in the Yamane study, on the other hand, did not differ significantly. In view of the fact that cooling attenuated the acute changes in satellite cell numbers and activity of kinases that regulate muscle hypertrophy, it is still likely that what we are dealing with, here, is another instance of a blunted hormetic response to exercise-induced stress. Now, with just one study investigating only one muscle group, you may well argue that this could be an outlier and eventually it's thus not a problem or even beneficial if you use cold water application or cold water immersion after every workout. study 1 - 21 physically active men strength-trained for 12 weeks (2 d/wk), with either 10 min of CWI or active recovery (ACT) after each training session. 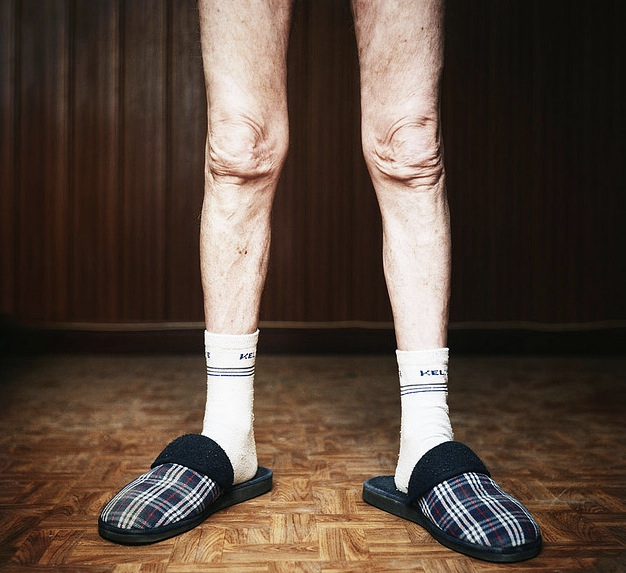 The sessions involved mainly the lower body. 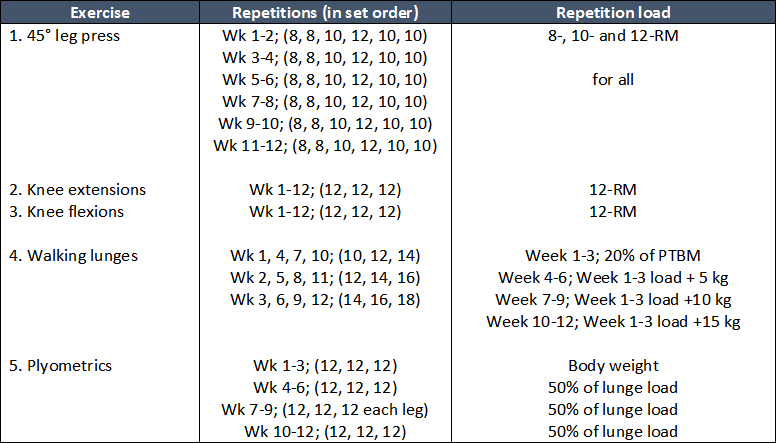 Training sessions were performed twice a week, separated by 72 h. The loads were set to 8-rep, 10-rep and 12-repetition maximum (RM), and weights corresponding to a proportion of each participant’s body mass. Strength training was progressive and included 45° leg press, knee extension, knee flexion, walking lunges and plyometrics exercises. The plyometric component comprised countermovement drop jumps, slow eccentric squat jumps, split lunge jumps and countermovement box jumps. All strength training was supervised and was performed at normal room temperature (23–25°C). The cold water immersion (CWI) itself was performed within 5 min after each training session. The procedure is described as follows: "Participants in the cold water immersion group sat in an inflatable bath (iCool iBody, iCool, Miami, Australia) for 10 min with both legs immersed in water up to the waist. Water was circulated continuously and maintained at 10.1 ± 0.3°C using a circulatory cooling unit (iCool LITE, iCool)" (Roberts. 2015). Update from 2017: When I wrote the article at hand in 2015, I still speculated that if cold water immersion was bad hot water immersion may turn out to do the opposite: promote the gains. Unfortunately, that is not the case. 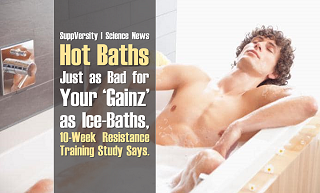 Addendum on hot water immersion: In May 2017, a new study (Peak 2017) shows that hot baths will have similarly detrimental effects on skeletal muscle hypertrophy in a 10-week study with young trainees in which the participants completed 10 weeks of lower-body hypertrophy resistance training, 2 days a week with or without ten minutes of hot water immersion (HWI | 45°C) or placebo baths after each training session. While both groups increased their strength for all three exercises, the relative increase in DXA leg muscle mass was significantly less after HWI (p = 0.011, 2.1-fold). In contrast, the active recovery group performed 10 min active recovery at a self-selected low intensity on a stationary cycle ergometer (Wattbike, Nottingham, United Kingdom) at a really light mean intensity level of 59.5 ± 9.4 W.
Figure 2: Training-induced changes in type II fiber count and size (left, top), myonuclei per fiber (left, bottom), leg press strength (A), knee extension strength (B), isometric torque (C) and RFD impulse (D | Roberts. 2015). Just as it was the case in the much smaller wrist muscles in the Yamane study, the strength and muscle mass increases in the legs of the subjects in the Roberts study were blunted by the application of cold water (CWI). 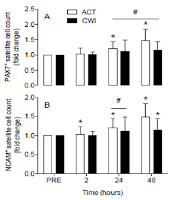 Practically speaking this means that the isokinetic work (19%), type II muscle fiber cross-sectional area (17%) and the number of myonuclei per fiber (26%) increased in the ACT group (all P<0.05) but not the CWI group. If you want to know something about the reasons for these statistically significant and practically highly relevant difference are concerned, I suggest you take a closer look at the red box - it may also help you to fully understand the bottom line. Bottom line: In conjunction, the studies presented in today's installment of "Too Much of a Good Thing" appear to confirm that regular post-exercise cold application to muscles might attenuate muscular and - even more surprisingly - the vascular adaptations to resistance training. That this is neither muscle- nor subject-specific can be concluded based on the similarities of the results from the two studies cited above. Against that background, there is little doubt that Roberts et al. rightly conclude that "[i]ndividuals who use strength training to improve athletic performance, recover from injury or maintain their health should, therefore, reconsider whether to use cold water immersion as an adjuvant to their training" (Roberts. 2015) | Let me know what you think on Facebook! Peake, Jonathan, et al. 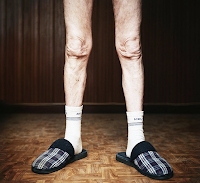 "Chronic and Acute Effects of Hot Water Immersion on Strength, Recovery and Hypertrophy." The FASEB Journal 31.1 Supplement (2017): lb735-lb735. Roberts, et al. "Post-exercise cold water immersion attenuates acute anabolic signaling and long-term adaptations in muscle to strength training." The Journal of Physiology (2015): Accepted article. Yamane, M., N. Ohnishi, and T. Matsumoto. "Does Regular Post-exercise Cold Application Attenuate Trained Muscle Adaptation?." International journal of sports medicine (2015).